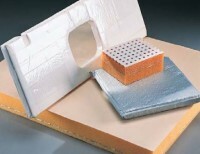 Solimide AC-550 foam is used in aircraft, and aerospace markets. Primary applications include aircraft fuselage, air conditioning duct, and equipment insulation. Solimide AC-550 foam is lightweight, non-wicking, fire resistant, thermal and acoustic insulation material. Solimide AC-550 foam provides weight savings, improved handling/installation characteristics and enhanced durability compared to traditional insulation resulting in lower operating and life cycle costs.